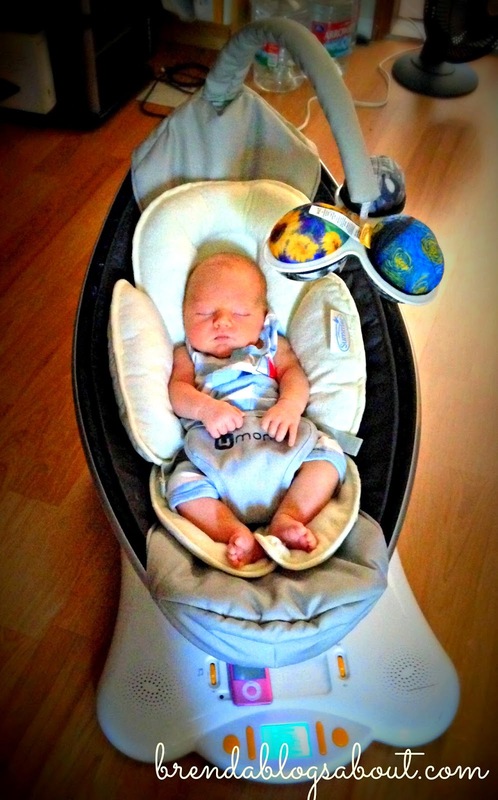 3 week old Malcolm chilling in his Mamaroo. It’s hard to believe Malcolm’s been here for a little over three weeks already! The days really seem to fly by when you end up stuck under an adorable sleeping baby for hours at a time. Sure, there are days when I’d like to get laundry done or cook dinner, but I know that he won’t sleep in my arms forever, so I’m trying to enjoy it as much as possible now. Laundry (except burp cloths) can wait. We can order dinner. We’ll make it work. Malcolm is a little cuddle bug. He LOVES being held. I’ve found that if I don’t set him down in the bassinet shortly after he falls asleep, he wakes up and gets cranky when I do eventually try to set him down. When he’s awake, we call him Mr. Floppy. Poor guy likes to toss his head around and bang it into my collarbone, which inevitably lead to him yowling in pain. I am not a fluffy mama – you can’t ram your head into my collarbone without it hurting the both of us! His life will get so much easier once he gains some head control! Malcolm HATES having a dirty diaper with a passion! Guinevere never really seemed to care when her diaper was wet. This one, however, the moment he wets his diaper or poops, he starts wailing. The wailing doesn’t stop until after the change is complete and we have picked him up and given him cuddles. Seriously, the way he cries during diaper changes, you would think someone is murdering him! I guess he just doesn’t like being cold and having his nether regions exposed. So far he tends to sleep a little better than Guinevere did at this age. I hate even putting that in writing because inevitably, the next couple nights, he’ll decide he just doesn’t want to sleep at all! Guinevere woke up every hour on the hour almost every night for the first three weeks of her life. Malcolm has given us several 2-3 hour chunks of sleep throughout many nights, which makes a huge difference in our exhaustion levels. However, when he doesn’t want to sleep, he REALLY doesn’t want to sleep and it is exhausting! When he does finally fall asleep, he makes all kinds of crazy noises. I remember my parents saying that my sister sounded like a Guinea pig when she was a baby. Malcolm kind of sounds like that. Guinevere was either silent or crying, nothing really in between until she started cooing, so these weird grunting and whining sounds emanating from our child in the middle of the night are a new thing for us. Malcolm was so much calmer than G in the first couple weeks after we brought him home that somehow he lulled me into a false sense of security that maybe we would get to skip the “witching hour” phase that we had with Guinevere. Guinevere would get fussy any time from 5pm on and there was pretty much nothing you could do to calm her down. Malcolm’s witching hour seems to start closer to 7pm – just in time for dinner/bed time routine with Guinevere. The worst is when he wakes G up with his crying and then they both start crying! So far, we’ve managed to deal with it with what I call the 2 “P’s”: pacifier and patience. Following the “Happiest Baby” techniques seems to work pretty well too. We swaddle him, hold him tight, sway and “sh” in his ear. It definitely seems to help calm him down. What techniques did you use for your baby’s witching hour?